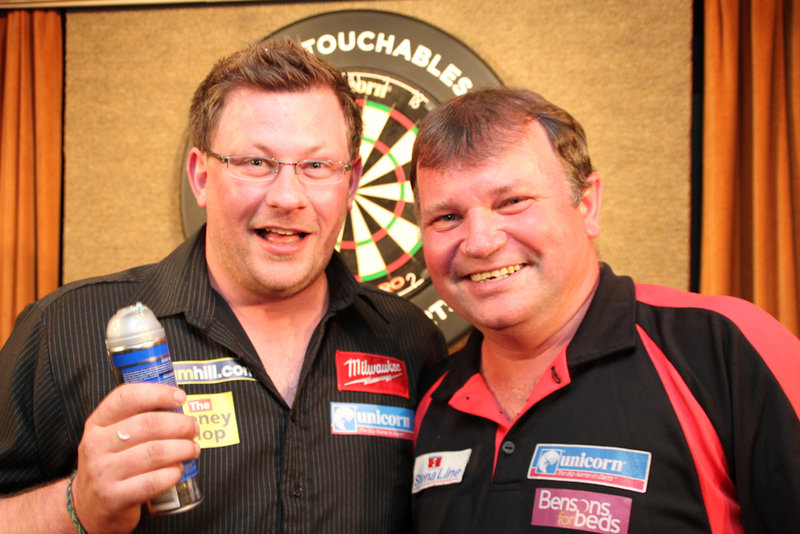 Generous darts fans turned out in force to for a special fundraising night on Friday, as nine of the world’s best players put on a show in aid of Bradbury Enhanced Care Service. Over 250 people attended the sell-out Untouchables event at Roffey Social and Sports Club in Horsham for an enjoyable evening of fun and top quality darts, which raised an incredible £8582 for a wonderful cause. Premier League stars James Wade, Simon Whitlock and Raymond van Barneveld were joined by Mark Webster, Paul Nicholson, Vincent van der Voort, Co Stompe, Michael van Gerwen and Terry Jenkins, who shaved off his moustache for the first time in 33 years. That momentous occasion proved to be particularly popular, raising a huge chunk of the money thanks to the combined kindness of fans, players and the event’s sponsors Unicorn. The opportunity to give Jenkins the new look was auctioned off, and there was no shortage of offers, with members of the crowd eventually being outbid by a collective effort from the players, who nominated Wade to carry out the act. ‘The Machine’ produced typical precision and razor-sharp finishing to get the job done. Unicorn bosses Edward and Richard Lowy then kindly pledged to match the winning bid, meaning Jenkins’ moustache was worth well over £1000. “We were only too pleased to donate for such a worthy cause,” said Richard Lowy. “There is something about darts that you just wouldn’t get in a lot of other sports. The players are in touch with reality and the fans can connect with them. All of the money raised through the event went to Bradbury Enhanced Care Service, which provides crucial support for young adults with complex health needs, physical disabilities and life limiting conditions. Some of the staff and residents of the unit attended the event, which was brilliantly hosted by ‘Little’ Richard Ashdown. All at MODUS would like to extend a massive thank you to Carlsberg, Unicorn, all of the players and most importantly everyone that attended on a special night and helped support a truly worthy cause. Andy Jenkins and James Hubbard both qualified for the PDC’s second European Tour Event, The German Darts Championship, which takes place in Berlin next month. The pair were amongst the 20 UK qualifiers that progressed from a field of 63 professionals at Crawley’s K2 Centre on Friday evening. Hubbard triumphed 6-3 over Andrew Gilding and Kevin Dowling, as he continued the brilliant run of form which saw him crowned PDC Unicorn World Youth Champion on McCoy’s Premier League finals night. Jenkins whitewashed Ryan Harrington to book his place on the plane to Berlin, after receiving a bye in round one. James Hubbard hailed his PDC Unicorn World Youth Final victory as ‘a dream come true’, after the 19-year-old beat Michael van Gerwen at the O2 Arena in London on Thursday. The Norfolk youngster put on a highly impressive display to overcome his 23-year-old opponent in front of 10,000 people, ahead of the final of the McCoy’s Premier League. Hubbard banished any fears of nerves on the big stage when he opened the match with a brilliant eleven dart leg, before going on to take the match 6-3. “It feels amazing,” said the former painter and decorator, who only turned professional in January. “When you start playing darts, this is the stuff that dreams are made off. 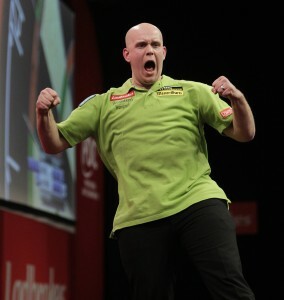 Hubbard, who took the first three legs before van Gerwen replied, admitted that he was nervous ahead of the match. ‘Mighty Mike’ refused to beaten easily and Hubbard knew that he had his work cut out when the Dutchman reduced his lead to 4-3 with a fantastic 102 checkout. “I did get quite nervous when Michael launched a comeback because he is a quality player,” said Hubbard. Hubbard won the final two legs of the match to become World Youth Champion, and the youngster declared his gratitude for the support he has received. “It was the best feeling in the world when that double top went in to win. I’ve come into form recently on the Pro-Tour & I’m over the moon to be in the UK Open next month,” added Hubbard, who heads to Bolton as a top 32 seed after reaching the quarter-finals of a recent qualifier. “I’ve been helped all the way by the people around me at MODUS. 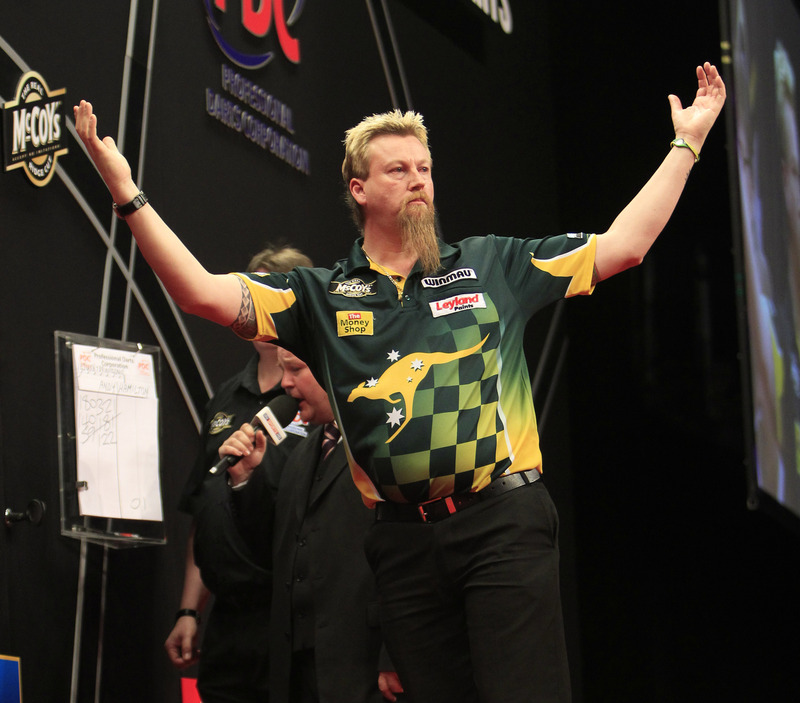 Mark Webster, Paul Nicholson and Simon (Whitlock) have been brilliant. Mark sponsors me and I always want to impress him and repay the faith he has put in me. “The same goes for everyone involved. Mervyn King will be delighted for me as well. This is for him too. I practise with him a couple of times a week and he drives me to the Pro-Tours. He is like a second dad to me and he has given me so much advice. Simon Whitlock was denied a double comeback in the McCoy’s Premier League Play-offs, after the Australian, who hit a nine-dart finish in his semi-final triumph over Andy Hamilton, was denied victory by Phil Taylor in the final. ‘The Wizard’ came back from 4-1 down to win 8-6 in his last four clash with ‘The Hammer’, in which he produced a moment of pure magic, when he achieved the fabulous feat of a perfect leg, sending the O2 Arena’s 10,000 strong crowd into raptures. Whitlock looked like he might produce an even more remarkable turnaround when he won five consecutive legs, to draw level with ‘The Power’ after trailing 7-2 in the final. 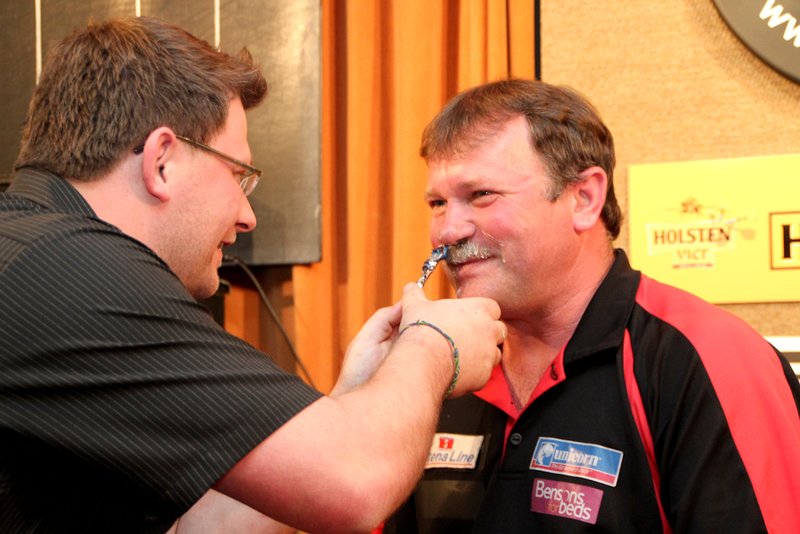 But Taylor halted Whitlock’s charge and won the last three legs to take the coveted crown. “It’s a bit disappointing in the end,” said Whitlock, who will now turn his attentions to next month’s UK Open in his quest for a first PDC major title. Taylor, who was crowned Premier League champion for the sixth time, hailed the performance of his opponent. 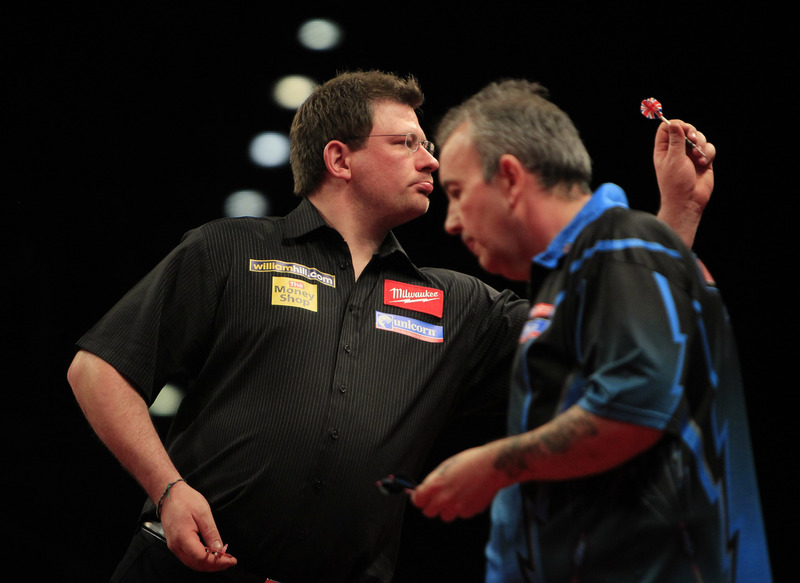 James Wade had earlier given ‘The Power’ an almighty scare, when he ran Taylor agonisingly close in the semi-final. ‘The Machine’ was undone by a brilliant 149 checkout from the world number one, when the pair where tied at 6-6, with Wade on throw in the race to eight. Whitlock almost produced the exact same finish in the final, but just missed double 16 to take an 8-7 lead. James Hubbard came away from London’s O2 a happy man, after beating Michael van Gerwen to be crowned PDC Unicorn World Youth Champion. The 19-year-old produced an impressive performance to take the title and £10,000 prize money. James Hubbard showed maturity beyond his years to win the PDC Unicorn World Youth Championship, with a classy performance in the final against Michael van Gerwen at London’s O2. The youngster, appearing on TV for just the second time, oozed quality in a match where both players played fantastic darts. The match, which preceded the final of the McCoy’s Premier League, more than befitted the occasion and delighted the 10,000-strong crowd. Hubbard showed no sign of nerves in the early exchanges, producing a stunning eleven dart leg to hold his throw. Van Gerwen levelled up the maximum count in the second leg, but Hubbard doubled his lead by taking out 32, after a fabulous 171 setup. 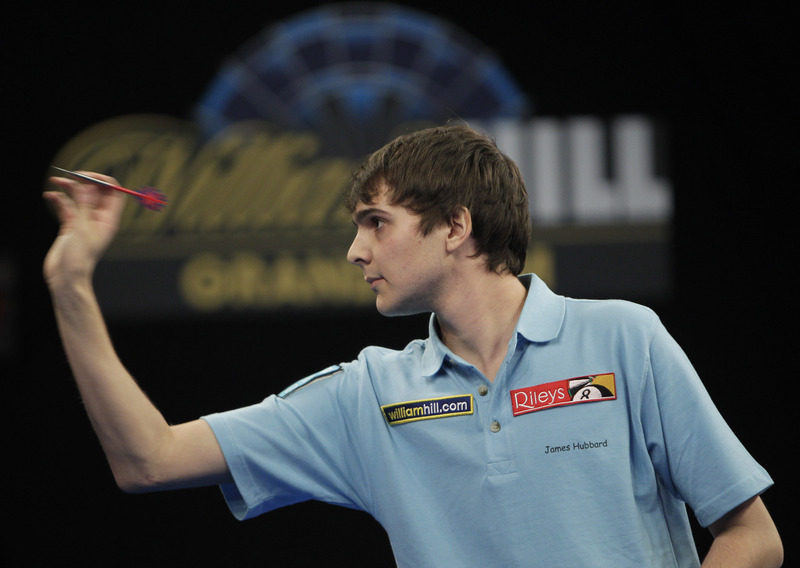 The 19-year-old’s sharp shooting continued, as he took out 81 in two darts to extend his advantage to three nil. ‘Mighty Mike’ produced a clinical finish of his own, taking out 76 for a 14-dart leg, before Hubbard regained his three leg lead. Van Gerwen took out 48 to hold his throw in the sixth leg, before grabbing his first break of throw, thanks to his second 180 and a brilliant 102 finish. But Hubbard broke straight back, hitting double top to leave himself throwing for the match, and he hit the same double to become World Youth Champion. James Wade produced a fantastic performance, but it wasn’t enough to prevent Phil Taylor reaching the McCoy’s Premier League final. Wade gave ‘The Power’ an almighty scare, pushing his opponent all the way, but a brilliant 149 checkout against the throw in the penultimate leg of the match was effectively the difference, in a high quality affair at London’s O2. Wade settled in quickly, as he held his throw with a twelve-dart leg, but ‘The Power’ took out 112 to level up. ‘The Machine’ edged back in front by taking out 104 in ruthless fashion, before Taylor hit double eight to restore parity. Wade hit his first 180 in the fifth leg and Taylor responded in kind. ‘The Machine’ then narrowly missed the bullseye for a 161 checkout, but tidied up the remaining 25 to restore his lead. The world number three grabbed a potentially crucial break of throw before the break, hitting his second maximum in the process. Taylor broke back immediately after the interval, before holding to tie the match at four legs each. Wade missed double 18 by no more than the width of the wire, before the world number one hit double five to break. With Taylor leading for the first time in the match, Wade piled on the pressure by hitting another maximum against the throw, but Taylor managed to hold after both players missed darts at their double. ‘The Machine’ hammered home his fourth 180 in leg eleven, before hitting double twelve to cut the deficit to a single leg. Wade just missed the bull again, this time for a spectacular 164 checkout, but he hit trusty double ten to grab what looked like being a vital break of throw. Taylor took out a brilliant 149 finish on Wade’s throw to leave himself throwing for the match, before hitting double top to progress to the final. Simon Whitlock hit a sensational nine-dart finish in an 8-6 victory over Andy Hamilton, as ‘The Wizard’ booked his place in the McCoy’s Premier League final and moved a step closer to clinching his first PDC major title. ‘The Wizard’ was one nil down when he produced a perfect leg, hitting two maximums before taking out 141 with treble 20, treble 15, double 18. The Australian ace went on to defeat Hamilton, despite trailing his opponent 4-1 after his nine-darter. “That was a fantastic match. Andy has had a fantastic year,” said Whitlock, who was beaten by ‘The Hammer’ in the semi-finals of the World Championship in January. “I’m over the moon to win the match. I had to throw a nine-darter to beat him; he’s always brilliant against me. Having won the bull in the practice room, ‘The Wizard’ threw first, but he was broken by a neat 130 checkout from Hamilton. ‘The Hammer’ opened the next leg with the first 180 of the match, before Whitlock responded in amazing style, breaking back with his spectacular nine-darter. Hamilton hit double 16 to edge back in front, before holding for the first time to double his lead. The 2012 Ladbrokes World Championship finalist then made it four out of four on the doubles, as he moved three legs in front. ‘The Wizard’ slotted in his third 180 before hitting double top for a crucial break of throw, as both players went into the break with a one hundred percent record on doubles. The Australian hit double ten to win the seventh leg, but Hamilton held his throw to go 5-3 ahead. Whitlock punished Hamilton for missed doubles, when he hit double six to take a crucial leg, reducing the deficit to a solitary leg once again. ‘The Hammer’ restored a two-leg cushion, with another tidy finish, this time taking out 110 in three darts. Whitlock responded by quickly closing the gap once more, hitting his fourth maximum, before finishing 84 in audacious style, going bull and double 17. ‘The Wizard’ then hit double top to grab a vital break of throw and tie the match at six legs a piece. Hamilton had two darts to retake the lead before Whitlock stepped in to hit double nine, and take the lead for the first time in the match. The 2010 semi-finalist ensured he would go at least one step further this time, as he took out 76 to book his place in the final. 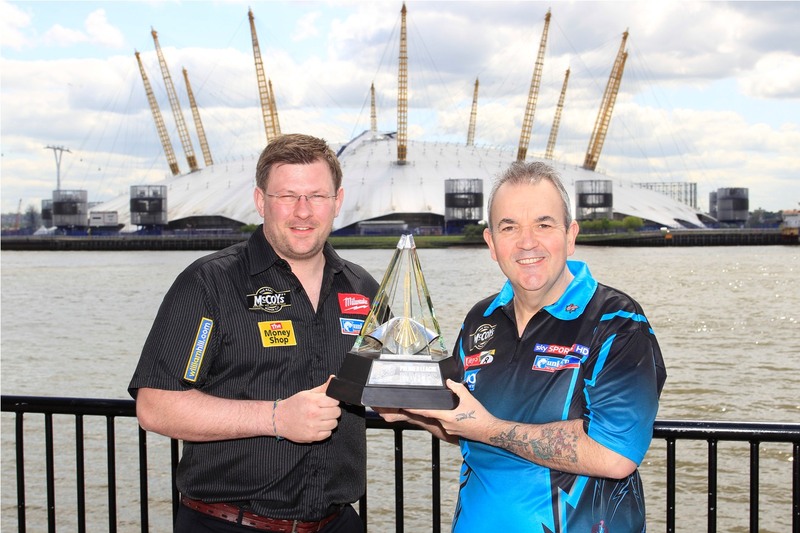 James Wade could be crowned as McCoy’s Premier League Champion for the second time, while Simon Whitlock is chasing his first PDC major title, when the competition’s Play-Offs take place at London’s O2 Arena on Thursday evening. The MODUS pair could meet in the final of the prestigious tournament, but will have to overcome two tough competitors in the semis first. 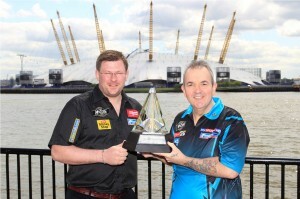 Wade takes on Phil Taylor in a repeat of the historic 2010 final, when two nine-darters from ‘The Power’ were the deciding factor in the match. The last-four clash sees the PDC’s two most successful players go head to head, with Wade gunning for an eighth televised title on the night. “I’ve got to win two games now but it’s not as simple as that because I’m playing Phil in the semis,” said Wade, the world number three. “Hopefully I’ll win the first one and then we’ll see what happens. “I think it’s quite clear that Phil does something special against me and prepares perhaps even a little bit differently. 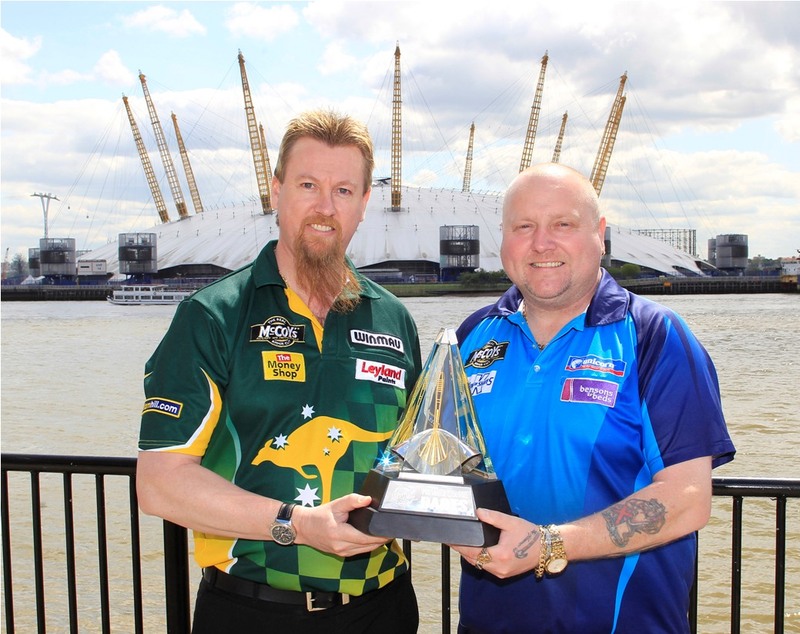 Preceding that game is a familiar semi-final pairing, as Whitlock faces the player who denied him a second Ladbrokes World Championship final appearance in January, Andy Hamilton. ‘The Wizard’ reached the semi-finals of the Premier League two years ago, and wants to go even further this time, after qualifying for the Play-Offs in second place. He said: “I set myself goals and I’ve achieved the first one, but the job’s not done yet – I want to make the final and win it. Both semi-finals will be the best of 15 legs, with the triumphant players preparing for a best of 19 battle in the final. Sandwiched in between is a best of eleven legs shoot-out between MODUS pair Michael van Gerwen and James Hubbard, who are competing for the title of PDC Unicorn World Youth Champion. 19-year-old Hubbard, who recently qualified in the top 32 for the UK Open, believes he has proved that he has what it takes to take to the title. The evening will also see a special performance of the charity single ‘Got My Ticket For The Darts’, written by Chas Hodges and released this week to raise money for Haven House Children’s Hospice, priced at 99p and available from iTunes. Michael van Gerwen is determined to be crowned PDC Unicorn World Youth Champion when he takes on James Hubbard in the final on Thursday evening. The Dutchman, who lost out to Arron Monk in the Under-21 final last year, believes his experience could hold the key to success. Van Gerwen and Hubbard are set to do battle in front of a PDC record crowd of over 10,000, when they meet at London’s O2 Arena before the final of the McCoy’s Premier League. “I’ve been getting a lot of practice in to prepare for Thursday,” said van Gerwen, whose final appearance will be his last ever game on the youth tour. “Last year I lost in the final and I was very disappointed. It’s my last chance to win this title and I want to take it with both hands. ‘Mighty Mike’ has already tasted major professional success. 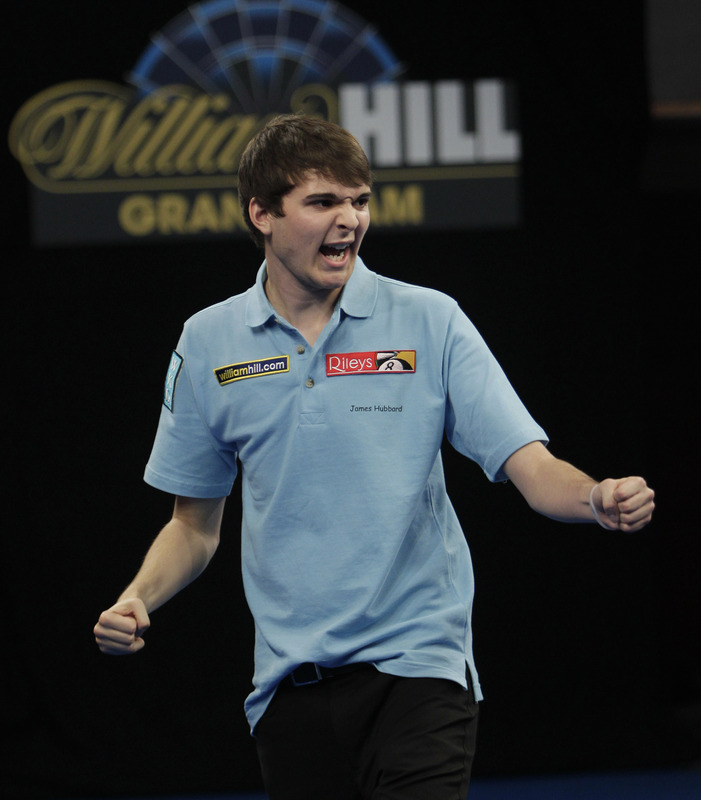 He became the youngest player to win a major tournament when he won the Winmau World Masters in 2006, aged just 17. The Dutchman believes that he if can perform at his best, then he will triumph once again. “James has less experience than me in big tournaments, so I think he is the underdog in the game but he knows that, and it could work to the advantage of either player,” said van Gerwen, who is now 23. “I have to play my own game and not make the mistakes I did last year. If I do that, I am sure I will win, but I have to go out there and do it before I talk about it. 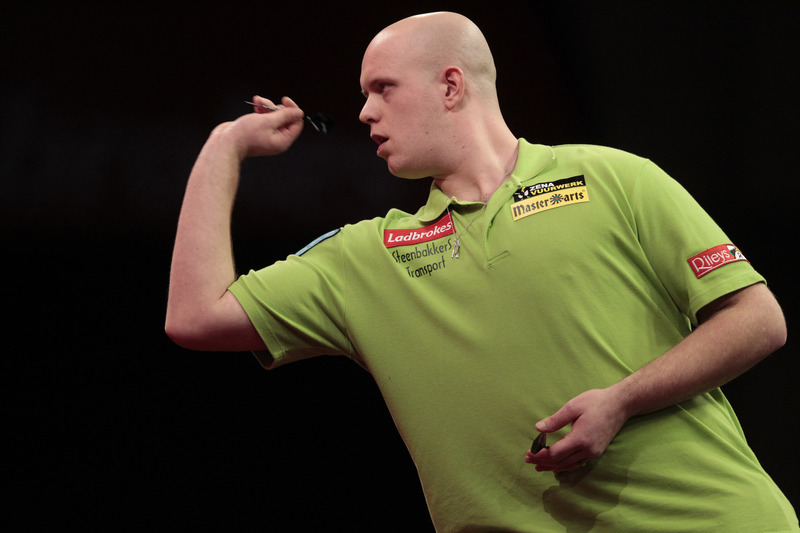 Van Gerwen has been in good form so far this year. He won a UK Open qualifier in Crawley and hit a nine-dart finish. Fellow Dutchman Vincent van der Voort believes that his compatriot has what it takes to win on Thursday night and go on to claim bigger successes in the future. He said: “I know he is determined to win and I think he will. I have never seen anybody with as much natural talent as Michael. Despite his success on the professional tour, van Gerwen is focusing purely on winning his next match and being crowned as World Youth Champion. 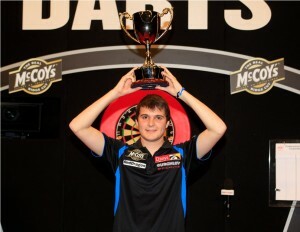 James Hubbard insists that he has nothing to fear ahead of the PDC Unicorn World Youth Championship Final on Thursday. The 19-year-old takes on Michael van Gerwen at London’s O2 in front of an expected record-breaking crowd of over 10,000, before the final of the McCoy’s Premier League. The youngster has been enjoying some good form on the professional tour, and is confident that he can take that onto the big stage. “I’ve proved recently that I can hold my own in professional events,” said Hubbard who reached his first professional quarter-final at the recent UK Open qualifier. “My run to the quarter-final in Birmingham has given me a massive confidence boost. I’m looking forward to playing Michael, knowing that I’ve beaten players of the same calibre. “I went to the Premier League in Newcastle last week to get a feel for the competition, and the crowd were amazing. There’s going to be at least twice as many people at the O2. Hubbard’s run in Birmingham helped him secure a place at his second major televised tournament next month, when he joins the UK Open in round three as one of the top 32 qualifiers. One stand-out game included a brilliant 157 checkout from Hubbard, in a deciding leg against Dennis Smith. The youngster believes that he may need to repeat this kind of sharp finishing under pressure to overcome a more experienced opponent in 23-year-old van Gerwen. Hubbard said: “I won’t do anything out of the ordinary in preparation for the final. I’ll just stick to my usual practise routines. My scoring has been brilliant for about a year now so I am focusing more on finishing. “I think the pressure is more on Michael because he has more experience. He lost in the final last year as well so that could be playing on his mind. Hubbard is being backed by former World Champion Mark Webster, who sponsors the 19-year-old. “James can definitely win it and he can take a lot from what will be a fantastic experience,” said Webster, who took part in 2011 Premier League. Hubbard, who made his TV debut at the 2011 Grand Slam of Darts, hopes to emulate the success of his friend Arron Monk, who beat van Gerwen to lift the Under-21 title last year. He added: “Winning would mean everything to me. When you first pick up a dart you dream of being a World Champion.